I have been trying, and trying, and trying some more to get a good Red Winged Blackbird photo. 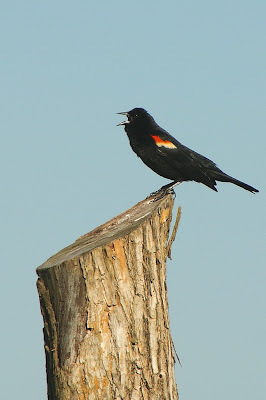 Yes, I have many, many, many photos of the Red Winged Blackbird, but none of them are what I'd call "really good". They're all just "O.K." photos. Well, I finally got one that pleases me quite a bit. No, it's nothing outstanding, but it's better than anything I have so far. So, I'm pretty happy with it. As I walked past the pond, to head on a walk through my favorite area, I was approaching the gate and met this friend. It was sitting on the fence post right by the gate. When it saw me, it proceeded to start singing its heart out. I don't know if it was singing about the best acne treatment , the weather, or if it was simply telling me to get the heck away so it could sit in peace, but I sure do appreciate that it gave me the time to take this photo! And you caught him singing too! They have such a unique call too. I love the photo too - great angle of the stump, with the bird as King of the meadow! A beautiful photograph, Misty. I think they are the most attractive of the blackbirds because of the red patch on the wings. I love the photo! What a great pose, and even the angle of the stump is cool. Joy to the World, joy to the world, that is what it looks like! Do they dive bomb you when they are finished singing, here they do. Great shot! He seems to have something to sing about. Great capture of the RW Blckbird singing. I can almost hear him! the symmetry of the bird on the tree stump is amazing! This really is something special - just lovely. Nice pic. He looks like he's making a speech. I don't see those birds here-but I did get a good shot of one in Savannah a couple years ago; a thrill for me! WOW. I have so many blurry photos or behind a branch. Never a great one. Yours is really good. It gives me hope and determination! That is a REALLY nice shot!! We have them here, too, and you are right...they are fast little guys and hard to photograph. Kudos to you! You crack me up! Honestly, this is a terrific shot!